Civil Coping Mechanisms, 9781948700122, 94pp. 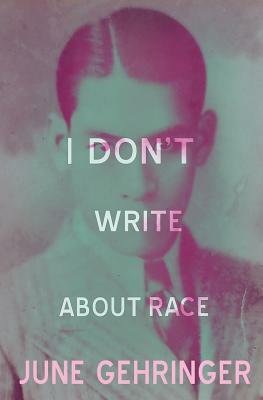 I don't write about race is a poetic exploration of identity, as told through apologies, anecdotes, and admonitions. An autofictional cosmogony of a girl who has been alive too long, this collection of poems represents both the absolute culmination and the ultimate failure of the author's lifelong search for identity. As its speaker becomes ever more estranged from conventional sources and modes of meaning and kinship, delving from relationship to bar, bar to relationship, from one city, partner, and job to the next, juggling relationship between families both biological and chosen, she becomes intimately acquainted with alienation. I don't write about race engages ever more intimately with one of the fundamental questions of literature: what do you do when you wake up again, alone, and somehow still yourself?